It has been raining off and on for the past few days since we had the heat wave. It means that I sit inside of Tiny House Ontario and read. The rain is great for the garden which is growing great. I think I should be able to have salad for supper tonight, and so begins the start of the 0 mile diet. During a lull in the rain, I weed the garden and note that the chicken wire over the part of the garden which had big seeds that the critters dig, is difficult to pull weeds out of. I have to wait until they are a little bigger and come up through the wire. That is my story, I am sticking to it. 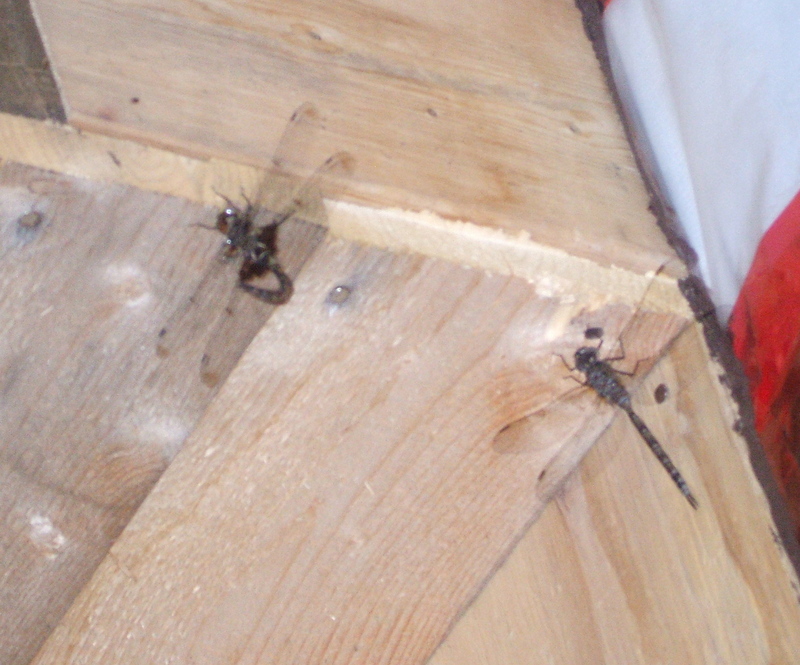 When I was out checking on the garden I noticed that the dragon flies are using my soffit to hide under. As for what I have read while I am shut-in and cuddling with the canines. Shirley Gibson-Langille’s Landscapes and Inscapes which is an utterly charming book which melds her paintings into the history of the Kingston area. Augustin Burroughs This is How which is LOL funny, but also astute! The guy tells it the way that it is, and I sort of fear that he is probably right about a lot of issues. Lastly Anaïs Nin In Favor of the Sensitive Man which is a rather 1970’s look at men and women, but still somehow interesting. I will begin another tonight.